Home > Browse > Le préservatif. Parlez-en comme vous voulez, mais parlez-en. Le préservatif. Parlez-en comme vous voulez, mais parlez-en. The condom. Talk about it any way you want, but do talk about it. 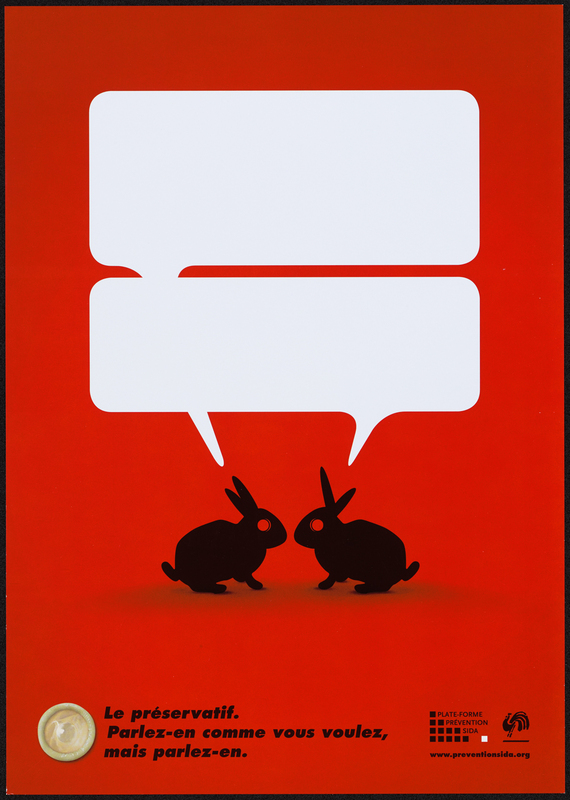 A drawing of two rabbits facing one another, with empty bubbles coming out of their heads, presumably symbolizing a clean slate. A condom next to the organization's logo. This image may be protected by the U.S. Copyright Law (Title 17, U.S.C.). It is displayed here only for the purposes of research. The written permission of the copyright owners may be required for distribution or reproduction beyond that allowed by fair use. All responsibility for obtaining permissions, and for any use rests exclusively with the user.